The women’s movement in Macedonia is fighting an uphill battle. 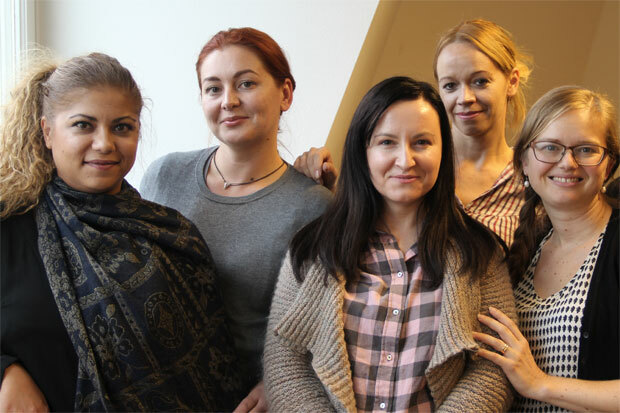 But thanks to the support from Kvinna till Kvinna, one of our partner organisations has succeeded in raising women’s rights on the political agenda. Two of our Macedonian partner organisations, National Network to End Violence Against Women and Domestic Violence and REACTOR - Research in Action, during a visit to Kvinna till Kvinna’s head office. Photo: Anna-Carin Hall / Kvinna till Kvinna. At the best of times, civil society work in Macedonia can be an uphill battle. In recent years, the country’s political crisis, which started with a wiretapping-scandal, has made matters even worse. Civil society organisations are often discredited and perceived as “foreign agents” or a “threat to the motherland”. In this turbulent context, advocating for gender equality is not easy. Many see the work as a “luxury” pastime, rather than an opportunity to redefine structures and make society more equal. “In recent years, women’s position in Macedonia has deteriorated. There is little political will to address gender inequality,” sighs Sanela Shkrijelj from Kvinna till Kvinna’s partner organisation National Network to End Violence Against Women and Domestic Violence. To strengthen women’s rights in Macedonia, our partner organisations point out the importance of proper implementation of gender-based violence legislation. They also call for the Istanbul Convention to be ratified. The Istanbul Convention is the Council of Europe’s convention to prevent domestic violence and violence against women. The convention focuses on preventing all forms of violence, protecting survivors, and prosecuting accused offenders. It is the first of its kind to create a comprehensive legal framework and approach to stop violence against women. The Istanbul Convention was adopted on 7 April 2011. So far, it has been signed by 46 countries (including Macedonia) and ratified by 33. “Having the convention ratified would give the women’s movement a powerful tool to put pressure on policymakers and the government. It would help us address the roots of the gender discrimination that exists in families and the political, economic and social spheres,” says Sanela Shkrijelj. So far, Macedonia has not yet ratified the convention. That means the country is under no legal obligation to follow it. This summer, the National Network to End Violence Against Women and Domestic Violence booked an inspiring success when it convinced politicians from eleven political parties to attend a workshop. The workshop was part of the Kvinna till Kvinna-supported project “Combating violence against women in alignment with EU standards”, which aims to “engender” political parties’ programmes in Macedonia and address violence against women. After the workshop, several parties expressed a willingness to revise their political party programmes to include measures against violence against women. On 25 November (the International Day for the Elimination of Violence Against Women), the National Network to End Violence Against Women and Domestic Violence plans to invite all political parties to sign a joint declaration on the ratification of the Istanbul Convention. “Several of the parties we’ve met have already reacted positively to the idea,” enthuses Sanela Shkrijelj. “In 2013, we already wrote a pre-ratification plan that identified existing gaps and steps needed in all areas. Since then, we’ve mostly been targeting public institutions in our advocacy work. But this year, with the support of Kvinna till Kvinna, we’re working to put violence against women on the agenda of Macedonia’s political parties,” says Sanela Shkrijelj.